This paper examines the relationship between financial development and energy consumption in case of Turkey during the period 1980-2015 by adding economic growth and urbanization to the energy consumption specification. The ARDL bounds test indicates the existence of a long run relationship among financial development, economic growth, urbanization and energy consumption under the structural breaks. The DOLS estimation results reveal that energy consumption is determined by urbanization and financial develoment, respectively. The Toda-Yamamoto causality analysis indicates the presence of a causality running from financial development to energy consumption. In addition, a causality running from economic growth and urbanization to energy consumption is not found. The results can exhibit some policy implications for Turkey. Bu çalışma, finansal gelişme ile enerji tüketimi arasındaki ilişkiyi Türkiye örneğinde 1980-2015 döneminde ekonomik büyüme ve kentleşmeyi enerji tüketimi modeline dahil ederek incelemektedir. ARDL sınır testi, yapısal kırılmalar altında finansal gelişme, ekonomik büyüme, kentleşme ve enerji tüketimi arasında bir uzun dönem ilişkisinin varlığını göstermektedir. DOLS tahmin sonuçlarına göre; enerji tüketimi sırasıyla kentleşme ve finansal gelişme tarafından belirlenmektedir. Toda-Yamamoto nedensellik analizi, finansal gelişmeden enerji tüketimine doğru işleyen bir nedenselliğin varlığını göstermektedir. İlaveten, ekonomik büyüme ve kentleşmeden enerji tüketimine doğru işleyen bir nedenselliğe rastlanmamıştır. Sonuçlar, Türkiye için bazı politika eğilimleri ortaya koyabilmektedir. Ahmed, Khalid (2017), “Revisiting the Role of Financial Development for Energy-growth-trade Nexus in BRICS Economies”, Energy, 128: 487-495. Al-mulali, Usama; Lee, Janice Y.M. (2013), “Estimating the Impact of the Financial Development on Energy Consumption: Evidence from the GCC (Gulf Cooperation Council) Countries”, Energy, 60: 215-221. Ali, Hamisu Sadi; Yusop, Zulkornain Bin; Hook, Law Siong (2015), “Financial Development and Energy Consumption Nexus in Nigeria: An Application of Autoregressive Distributed Lag Bound Testing Approach”, International Journal of Energy Economics and Policy, 5(3): 816-821. Azam, Muhammad; Khan, Abdul Qayyum; Zaman, Khalid; Ahmad, Mehboob (2015), “Factors Determining Energy Consumption: Evidence from Indonesia, Malaysia and Thailand”, Renewable and Sustainable Energy Reviews, 42: 1123-1131. Brown, R.L. ; Durbin, J.; Evans, J.M. (1975), “Techniques for Testing the Constancy of Regression Relations over Time”, Journal of the Royal Statistical Society, 37(2): 149-163. Chang, Shu-Chen (2015), “Effects of Financial Developments and Income on Energy Consumption”, International Review of Economics and Finance, 35: 28-44. Çağlar, Abdullah Emre; Kubar, Yeşim (2017), “Finansal Gelişme Enerji Tüketimini Destekler Mi?”, Süleyman Demirel Üniversitesi Sosyal Bilimler Enstitüsü Dergisi, 2(27): 96-121. Deidda, Luca G. (2006), “Interaction between Economic and Financial Development”, Journal of Monetary Economics, 53(2): 233-248. Dickey, David A.; Fuller, Wayne A. (1981), “Distribution of the Estimators for Autoregressive Time Series with a Unit Root”, Econometrica, 49(4): 1057-1072. Doğan, Buhari; Değer, Osman (2016), “Enerji Tüketimi, Finansal Gelişme ve Ekonomik Büyüme İlişkisi: Hindistan Örneklemi”, Yaşar Üniversitesi Dergisi, 11(44): 326-338. Engle, Robert F.; Granger, C.J. (1987), “Cointegration and Error Correction Representation, Estimation and Testing”, Econometrica, 55(2): 251-278. Ertugrul, Hasan Murat; Cetin, Murat; Seker, Fahri; Dogan, Eyup (2016), “The Impact of Trade Openness on Global Carbon Dioxide Emissions: Evidence from the top Ten Emitters among Developing Countries”, Ecological Indicators, 67: 543-555. Farhani, Sahbi; Solarin, Sakiru A. 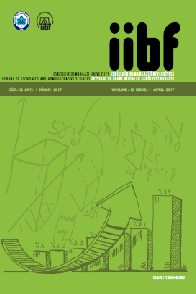 (2017), “Financial Development and Energy Demand in the United States: New Evidence from Combined Cointegration and Asymmetric Causality Tests”, Energy, 134: 1029-1037. IEA (2016). “Energy Policies of IEA Countries: Turkey”, https://www.iea.org, (Erişim: 25.04.2018). Islam, Faridul; Shahbaz, Muhammad; Ahmed, Ashraf U.; Alam, Mahmudul (2013), “Financial Development and Energy Consumption Nexus in Malaysia: A Multivariate Time Series Analysis”, Economic Modelling, 30: 435-441. Johansen, Soren; Juselius, Katarina (1990), “Maximum Likelihood Estimation and Inference on Cointegration with Application to the Demand for Money”, Oxford Bulletin of Economics and Statistics, 52(2): 169-210. Jones, Donald W. (1991), “How Urbanization Affects Energy Use in Developing Countries”, Energy Policy, 19(7): 621-630. Kakar, Zaheer Khan (2016), “Financial Development and Energy Consumption: Evidence from Pakistan and Malaysia”, Energy Sources, Part B: Economics, Planning and Policy, 11(9): 868-873. Keskingöz, Hayrettin; İnançlı, Selim (2016), “Türkiye’de Finansal Gelişme ve Enerji Tüketimi Arasında Nedensellik İlişkisi: 1960-2011 Dönemi”, Eskişehir Osmangazi Üniversitesi İİBF Dergisi, 11(3): 101-114. King, Robert G.; Levine, Ross (1993), “Finance and Growth: Schumpeter Might be Right”, Quarterly Journal of Econo-mics, 108(3): 717-738. Komal, Rabia; Abbas, Faisal (2015), “Linking Financial Development, Economic Growth and Energy Consumption in Pakistan”, Renewable and Sustainable Energy Reviews, 44: 211-220. Kumar, Ronald R.; Stauvermann, Peter J.; Loganathan, Nanthakumar; Kumar, Radika D. (2015), “Exploring the Role of Energy, Trade and Financial Development in Explaining Economic Growth in South Africa: A Revisit”, Renewable and Sustainable Energy Reviews, 52: 1300-1311. Lebe, Fuat; Akbaş, Yusuf E. (2015), “Türkiye'de Sanayileşme, Finansal Gelişme, Ekonomik Büyüme ve Kentleşmenin Enerji Tüketimi Üzerindeki Etkisi: Çoklu Yapısal Kırılmalı Bir Araştırma”, Ege Akademik Bakış,15(2): 197-206. Levine, Ross (1997), “Financial Development and Economic Growth: Views and Agenda”, Journal of Economic Literature, 35(2): 688-726. Liddle, Brantley (2014), “Impact of Population, Age Structure, and Urbanization on Carbon Emissions/Energy Consumption: Evidence from Macro-level, Cross-country Analyses”, Population and Environment, 35(3): 286-304. Mahalik, Mantu K.; Babu, M. Suresh; Loganathan, Nanthakumar; Shahbaz, Muhammad (2017), “Does Financial Development Intensify Energy Consumption in Saudi Arabia?”, Renewable and Sustainable Energy Reviews, 75: 1022-1034. McKinnon, Ronald I. (1973), Money and Capital in Economic Development, Brookings Institution, Washington, DC. Mudakkar, Syeda R.; Zaman, Khalid; Shakir, Huma; Arif, Mariam; Naseem, Imran; Naz, Lubna (2013), “Determinants of Energy Consumption Function in SAARC Countries: Balancing the Odds”, Renewable and Sustainable Energy Re-view, 28: 566-574. Narayan, Paresh K. (2005), “The Saving and Investment Nexus for China: Evidence from Cointegration Tests”, Applied Economics, 37(17): 1979-1990. Nasr, George E.; Badr, Elie A.; Dibeh, Ghassan (2000), “Econometric Modeling of Electricity Consumption in Post-war Lebanon”, Energy Economics, 22(6): 627-640. Pesaran, M. Hashem; Shin, Yongcheol; Smith, Richard (2001), “Bounds Testing Approaches to the Analysis of Level Relationships”, Journal of Applied Econometrics, 16(3): 389-326. Phillips, Peter C.B. ; Perron Pierre (1988), “Testing for a Unit Root in Time Series Regression”, Biometrika, Vol. 75, No. 2: 335-346. Phillips, P.C.B. ; Ouliaris S. (1990), “Asymptotic Properties of Residuals based Tests for Cointegration”, Econometrica, Vol. 58, No. 1: 165-193. Poumanyvong, Phetkeo; Kaneko Shinji (2010), “Does Urbanization Lead to less Energy Use and Lower CO2 Emissions? A Cross-country Analysis”, Ecological Economics, Vol. 70, No. 2: 434-444. Rafindadi, Abdulkadir A.; Ozturk, Ilhan (2016), “Effects of Financial Development, Economic Growth and Trade on Electricity Consumption: Evidence from Post-Fukushima Japan”, Renewable and Sustainable Energy Reviews, 54: 1073-1084. Sadorsky, Perry (2010), “The Impact of Financial Development on Energy Consumption in Emerging Economies”, Energy Policy, 38(5): 2528-2535. Sadorsky, Perry (2014), “The Effect of Urbanization and Industrialization on Energy Use in Emerging Economies: Implications for Sustainable Development”, American Journal of Economics and Sociology, 73(2): 392-409. Shahbaz, Muhammad; Lean, Hooi H. (2012), “Does Financial Development Increase Energy Consumption? The Role of Industrialization and Urbanization in Tunisia”, Energy Policy, 40: 473-479. Shahbaz, Muhammad; Hye, Qazi M.A. ; Tiwari, Aviral K.; Leitao, Nuno C. (2013), “Economic Growth, Energy Consumption, Financial Development, International Trade and CO2 Emissions in Indonesia”, Renewable and Sustainable Energy Reviews, 25: 109-121. Shahbaz, Muhammad; Loganathan, Nanthakumar; Muzaffar, Ahmed T.; Ahmed, Khalid; Jabran, Muhammad A. (2016), “How Urbanization Affects CO2 Emissions in Malaysia? The Application of STIRPAT Model”, Renewable and Sustainable Energy Reviews, 57: 83-93. Shahbaz, Muhammad; Hoang, Thi H.V. ; Mahalik, Mantu K.; Roubaud, David (2017), “Energy Consumption, Financial Development and Economic Growth in India: New Evidence from a Nonlinear and Asymmetric Analysis”, Energy Economics, 63: 199-1212. Stern, Nicholas (1989), “The Economics of Development: A Survey”, Economic Journal, 99(397): 597-685. Stiglitz, Joseph E. (2000), “Capital Market Liberalization, Economic Growth and Instability”, World Development, 28(6): 1075-1086. Topcu, Mert; Payne, James E. (2017), “The Financial Development-Energy Consumption Nexus Revisited”, Energy Sources, Part B: Economics, Planning and Policy, 12(9): 822-830. TÜİK (2012), İstatistik Göstergeler (1923-2011), TÜİK. WDI (2018), World Bank, World Development Indicators Database, http: www.data.worldbank.org, (Erişim: 10.03.2018).